Click to viewBy now, you might have noticed that James Tiberius Kirk is, well... kind of a dirtbag in the new Star Trek movie. He trashes a gorgeous Corvette at age 11, and just gets more obnoxious from there on out. He's not just cocky like ShatnerKirk, he's actually irresponsible, where Shatner was sort of uptight. Is it just because he's young and immature? Or is there something else going on, which might actually make for a more interesting movie? Spoilers ahead. How exactly does Kirk mess up in the movie? From what I can gather from interviews and presentations, he's a pretty lousy cadet who washes out of Starfleet Academy, before Captain Pike gives him the big motivational speech you hear in the trailer. He hits on Uhura in a really smarmy, condescending way, and later sneaks into her quarters to watch her undress. 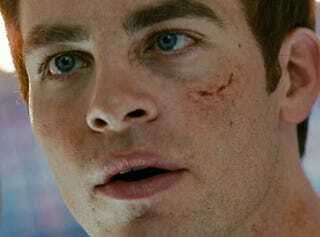 Worst of all, it looks like there's gonna be some angst, as Kirk figures out who he really is. But actually, the obnoxiousness of PineKirk could be part of the movie's storyline, in an interesting way. Maybe I've spent too much time parsing every interview and release about Trek for morning spoilers lately, but something jumped out at me when I read J.J. Abrams' comments on the trailer the other day. The movie's Romulan villain, Nero, travels back in time and destroys the U.S.S. Kelvin, the ship where both Kirk's parents are serving. As a result, Kirk and his brother have to go live with their uncle Frank. We already know, from actor Brad William Henke, that Uncle Frank is abusive and alcoholic, and makes the Kirk boys' lives hell. (That's Uncle Frank's Corvette that Kirk drives off a cliff in the trailer.) So there's a new timeline - one in which Kirk had a horrible abusive childhood. The Kirk who results is not the same Kirk whom we knew in the original series. And whether he steps up and becomes a great starship captain, he'll never be quite the same Kirk. Let's think about how time travel works in the Trek universe for a sec. It's a bit inconsistent, but here are a few pointers. In "City On The Edge Of Forever," McCoy goes back and changes history, and the Enterprise suddenly isn't in orbit any more. The timeline has changed, and only those protected by the Guardian's aura remember. In the episodes where Kirk and co. go back to the 1960s, they have to be very careful not to leave any traces, because any change to history will have unknown ramifications. On the other hand, in the TNG crapfest "Time's Arrow," Data's head turns up in the ground even though Data hasn't yet gone back in time to have his head buried. On the whole, though, I think there are multiple timelines and it's possible to change history, so that thing never happened. So then Old Spock goes back in time to try and prevent the worst of Nero's tampering. Obviously, NimoySpock isn't able to save the Kelvin from being destroyed. But I'm going to go out on a limb and say that Nero doesn't manage to wipe out the planet Vulcan with his black-hole drill thingy. And he probably doesn't kill Kirk, either. NimoySpock's hardest mission may be to help Kirk become the person he was supposed to be, before Nero forced him to go live with mean Uncle Frank. According to Memory Alpha, Kirk's pre-Nero childhood would have been quite different. There's no mention of Uncle Frank in the original series, but Kirk did have a different childhood trauma. He was living on the Planet Tarsus IV when there was a food crisis, and Governor Kodos decided to kill the 4,000 people least worthy to survive. (So if Kirk's parents had lived, he wouldn't even be in Iowa to crash that Corvette; he'd already be living on Tarsus IV.) Also, Kirk may not have been an exemplary cadet in Starfleet Academy, but he was promising enough to take part in a peace mission to the planet Axanar in his plebe year. And he distinguished himself enough on that mission to win a Palm Leaf, according to the episodes "Court Martial" and "Whom Gods Destroy." So actually, the Kirk coming-of-age story that's apparently at the heart of Star Trek may really be the story of an alternate timeline where Kirk gets emotionally and mentally damaged by Uncle Frank. And his oldest friend, Spock, has to travel back in time and rescue him. Probably, the movie won't even spell this out, but it adds an interesting extra layer for people who actually care about this stuff. Bottom line: Don't blame Kirk if he turns out to be a bit of a twerp in the new movie - it's all the fault of his time-travel-induced abusive childhood. Mmmkay?